The Sandman series would undergo huge changes in this period, and it's an oddity of comics history that the fondly remembered costume, and the fondly remembered stories, do not correspond at all. 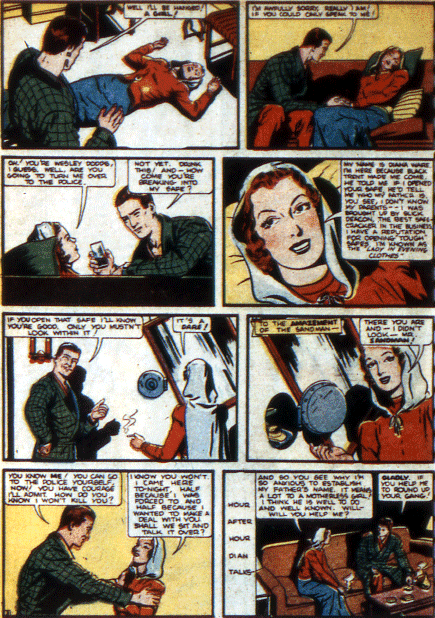 The big change in the series comes with Adventure Comics 69, as Wes gets a new costume and sidekick, but these changes are not reflected at first in his stories in World's Finest Comics, meaning Dian has her final appearance in World's Finest 5. There is no explanation for her disappearance or the costume change, though Roy Thomas would provide answers for both in All-Star Squadron in the 80s. He has Dian die in a car accident at this time, but as she is later shown to have become an elderly woman, the car accident must not have been fatal. 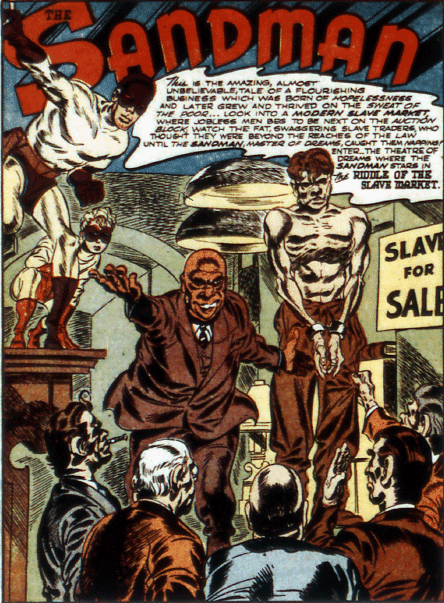 Sandy debuts in issue 69, in a costume he claims he patterned after Sandman's. This is curious, as his costume does match that of Sandman, but it matches the costume he has just started wearing, a skin-tight gold and purple outfit, with a purple cape. Sandy is in gold and red, with a red cape. 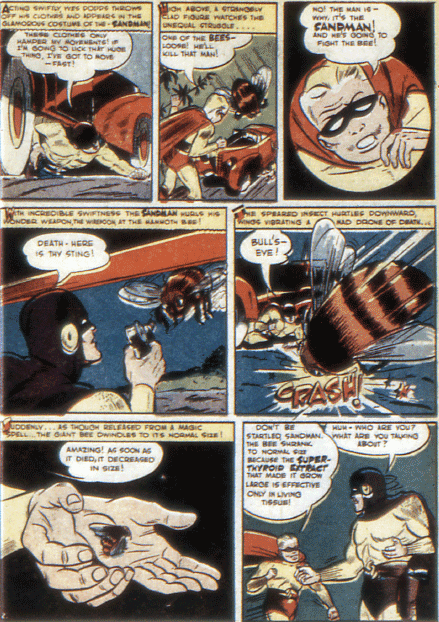 He is an orphan, staying at a farmhouse where the owner has experimented with creating giant bees, not thinking about the deadly giant stingers that would come with them. Wes apparently adopts Sandy at the end of the story, as they live together from this point on. 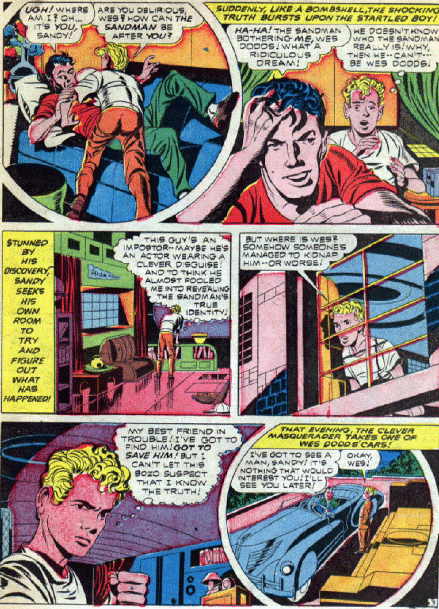 Sandy's last name is given as McGann in issue 71, but Hawkins in issue 73, and from then on. 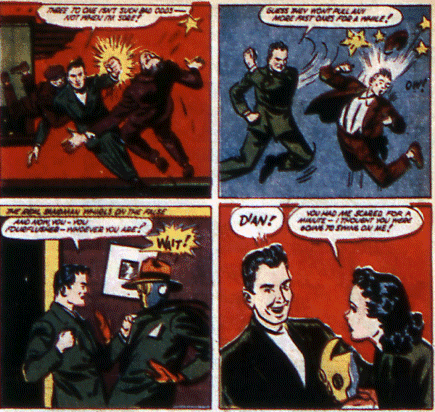 Incidentally, Sandy's full superhero name is Sandy the Golden Boy. I believe this would win not only gayest superhero name, but also least likely to make a villain scared of you. 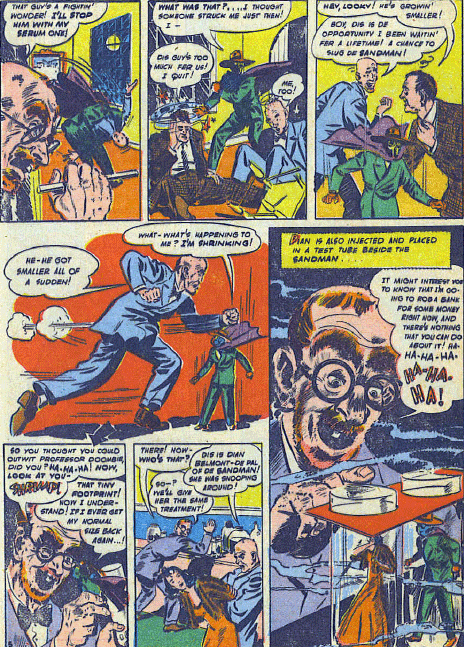 Two of the villains the Sandman faces at this time would be resurrected in the pages of All-Star Squadron. 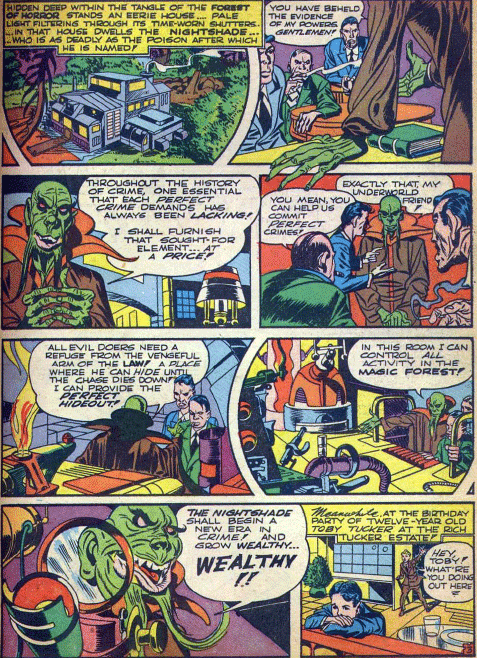 Nightshade, who has a great mask and a bunch of fake plants and traps in his "magic forest" debuts in World's Finest 6, while Adventure Comics 75 introduces Fairytales Fenton, "The Villain from Valhalla," who pretends to be the Norse god Thor. This is, I believe, the first time Kirby would render a Thor character, but obviously not the last! This story also has a beautiful full-page panel of Sandman and the police fighting "Thor" and his viking henchmen. Sandman deals with an insomniac who turns to crime in issue 80's "The Man Who Couldn't Sleep," and a narcoleptic framed for murder in 87's "I Hate the Sandman." The idea of wedding cake dreams foretelling the person you will marry is tidily worked into issue 83's "The Lady and the Champ." Sandy gets a starring role in issue 81's "A Drama in Dreams." 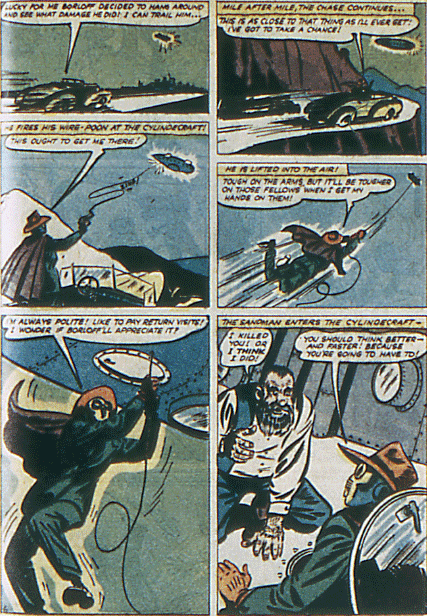 He is surprised to discover Wes having a nightmare about the Sandman, and realizes Wes has been kidnapped and impersonated. Sandy tracks him down and once Wes gets free he takes out his impersonator, and pretends to be him to get to the guy behind it all. 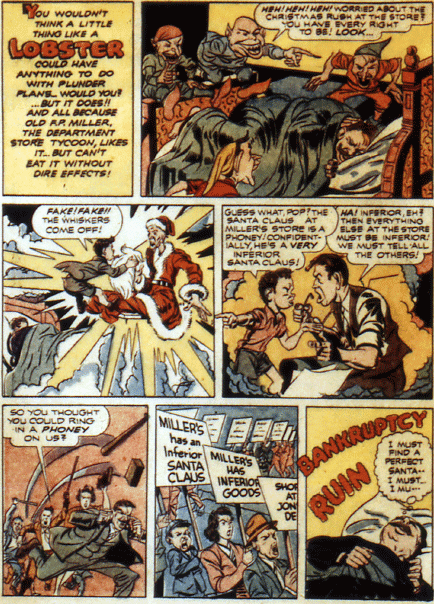 "Santa Fronts for the Mob," in issue 82, begins with a hilarious nightmare of department store owner P.P. Miller, who imagines that without a good store Santa people will picket and boycott his establishment. The man he hires has mob ties, but grows to love the job and the kids so much, when the time comes to rob the store he helps the Sandman take down the bad guys. Somehow this story manages to capture much the same feeling as movies like "Miracle on 34th Street" and "Holiday Affair," both also 1940s department store-based Christmas tales. 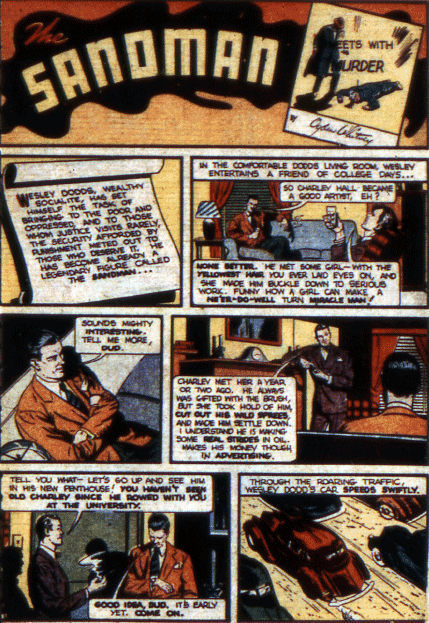 In my eyes, the crowning glory of this run is Adventure Comics 85, "The Unholy Dreams of Gentleman Jack." This opens with a prisoner dreaming of being waited on hand and foot by the guards, and Sandman bursting into his cell. Once he is released from prison, he has his apartment made up to resemble a jail, and his servants dressed as guards. 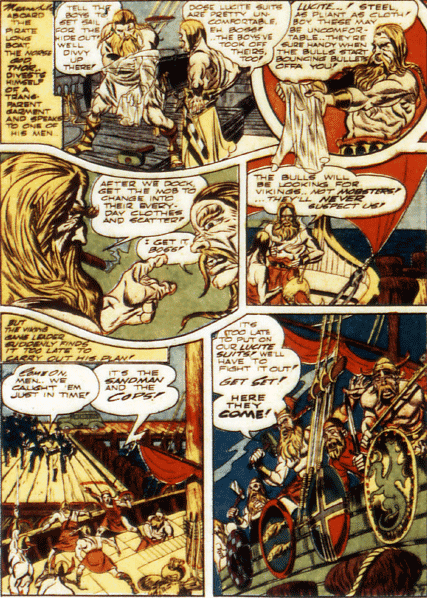 He lures Sandman to his place, so we get the visual from the dream a second time, but just shows him around and gets him off his guard, so his men can capture him. 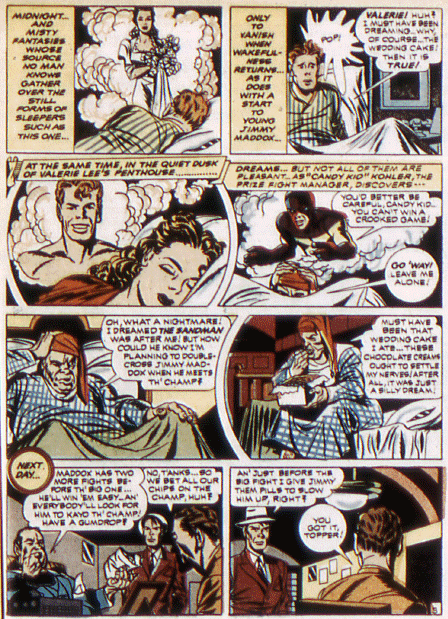 Gentleman Jack has Sandman put into a gas chamber to kill him, and goes to bed, unaware that Sandy has been following him. 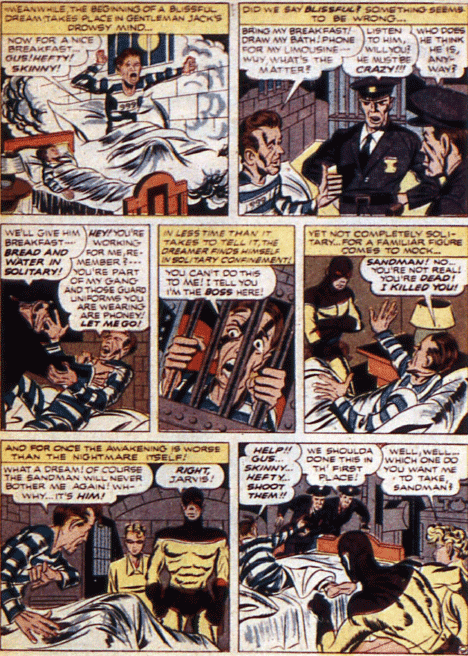 Sandy frees Sandman as Jack dreams that his servants are now acting like actual prison guards, and just as Sandman appears in his nightmare (the third time for the same visual) he wakes, discovering Sandman in his room, as well as police, playing that same visual for the fourth time in 10 pages! Each time we see Jack, the Sandman, the cell and the guards it is from a different perspective, and it is shown from another angle on the cover as well. This story could easily be muddled or repetitive, but instead is a thorough delight. Simon and Kirby were drafted before the end of the war. A few stories were kept aside, but other artists and writers were put onto the series with issue 91. The art is not terrible, but has none of Kirby's inspiration or skill, and the stories drop Simon's dream motif entirely.